The Marcellus Library has a lofty purpose, outlined in its Mission Statement: The Marcellus Township Wood Memorial Library serves as the center for lifetime learning and enjoyment in order to improve the quality of life for all citizens. It does this by providing resources that enhance and contribute to knowledge, enlightenment, cultural and recreational needs. As a community resource, the library’s mission is to enrich life, stimulate curiosity, foster literacy and provide the resources necessary for an informed citizenry. Just as it takes a village to raise a child, it takes a township to maintain a good library. Residents of Marcellus Township choose people to be responsible for maintaining and developing their “center for lifetime learning and enjoyment” when they elect trustees (also called library board members) at regularly scheduled general elections. These trustees are then responsible to make sure that the library is funded and well managed. They help to develop long-range planning, and meet every month to discuss and make decisions about the general operation and maintenance of the library. They discuss what kinds of programming the library will have, publicity and promotion, and the best technology needed by both staff and township residents. The trustees/board members are also responsible to hire a good director, who in turn hires and trains staff who help to keep the library open, up to date, vibrant and welcoming. There are currently five staff persons and occasional high school student workers at the Marcellus Library. Article 8 in this series told about the 5-Year Strategic Plan which was put in place in 1997 by the library board, focusing on automation of the library, building expansion, and increased financial support through millage. In 2019 the Library Board will evaluate their progress on the 2014-2018 Strategic Plan and prepare a new Plan for the coming years. The Marcellus Township residents who are currently elected to the Marcellus Library Board are: Joel Bartram, Sue Garcia (Secretary), Jennifer Jones (President), Sharon Melko (Treasurer), Carol Pica (Vice-President) and Heather Shenfeld. Recently these Trustees/Board Members were asked two big questions: What is the most fun part of developing the Marcellus Library? What is the most challenging part? Below are their responses. What is fun for the Marcellus Township Library Trustees (board members)? Heather Shenfield: Implementing ideas and suggestions provided by our patrons. Jennifer Jones: The joy I get the most from being on the library board would be all the happy patrons and the events that bring in so many people. If the library can bring so much joy to our small community, then the board is happy too. We are so lucky to have such a dedicated librarian; that makes our job so much easier. Sharon Melko: It is fun being a part of the board where each member has the same goal: to make this library the best it can be. We are a team of diverse people who respect and listen to each other, offer ideas and suggestions, and look forward to the future to give our community the finest services and programs. I love the planning, development and implementation of the events and activities for the patrons of all ages from preschoolers to lifelong learners. It is fun to walk into the building and see all the activities and know I had a part in making it happen. Carol Pika: Looking at new projects and towards the future. Sue Garcia: Seeing all the people using the library. Joel Bartram: For me the most rewarding aspect of being part of the strategic planning for the library is having the opportunity to help make the choices that will continue the impressive legacy that our library has earned over the many years that it has existed. I think anyone would be hard pressed to find a library from a similar demographically sized town that has continued to not just be successful but that has continued to grow in importance to the community. If you think about it, there isn't a place within ten miles of Marcellus where one can get access to a computer and the internet. That doesn't sound like a big deal, but when you think about how vital the internet has become to the way we live, it really is a big deal to many people in and around our town, especially those who have transportation issues. Many employers advertise for job openings online and will only accept applications online. A person without a job who does not have access to the internet is definitely at a disadvantage. Our library is able to help people get the information they need to make wise choices. Many times, when I drive home in the evening, I will see people sitting on the ground or the bench outside the library, with their lap tops or other devices, using the library's internet service. I think to myself how the role of a library in our community to help people get the information they need is still the same as it was when our library was first built. However, the way we can get the information to the people of our community is very different and will continue to be different as new technologies emerge. When I see these people using our library in these very non-traditional ways, I think that as a board member, it is my responsibility to make sure the library continues to plan and be in a position to ensure that the people in our community are able to access the services our library provides. What is most challenging for library board members? Heather Shenfield: Prioritizing our goals. Creating a strategic plan that can accommodate any future changes. Jennifer Jones: The most challenging part of being on the library board would be not having the financial funds to do everything the library board would like to do and needs to do. We do the best that we can with the help from our tax payers, grants and donations. Sharon Melko: It is challenging to be prepared for the future. We need to answer these questions: What services should our library be offering in five years and beyond? How do we match the services and programs with the revenue? How does the budget support the needs and services? How do we keep the building sound? What are the future needs of the community and what is the role of the library in helping to meet them? If we had a crystal ball to see the future we would know how to proceed. Instead we rely on input from our staff and the people in Marcellus to give us direction. That is the challenge and the reward. Carol Pika: Selecting events for everyone. Sue Garcia: Asking for money. Joel Bartram: The most challenging part is the limited resources we have to do all of the things that we want to do. The people of our community have voted to trust us to make wise choices with the tax money that they provide us with to run the library. With these funds we not only have to make sure we are spending in the best interest of the community, but we have to plan for all of the expenses that we know we will have, as well as the ones we don't know we will have. Our library is a beautiful old building and as we have seen in the last few years, when you least expect it, repairs come about that need to be paid for. So we are continually balancing the community's needs, the future's needs to provide different services and the building's needs as we undergo any planning. As Albert Einstein once said, “The only thing that you absolutely have to know, is the location of the library.” J,K. 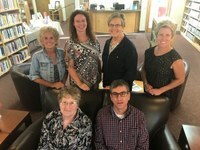 Rowling, author of the Harry Potter series, followed that up with her own bit of wisdom: “When in doubt go to the library.” The Marcellus Township Library Board works to make sure these words are true in Marcellus.